With an estimated blueberry area of 12,400 hectares, Chile is the second world blueberry producer. The country is main blueberry exporter in the southern hemisphere. Patagonia foods is a large blueberry grower with 4 production sites on different locations in Chile, with 110 total hectares, 20 in the north and 90 in the south zone of Chile. In 2008 they started using bumblebees as pollinators. Orchards manager Guido Córdoba shares his experience. Paco Lozano, Biobest’s technical advisor for Chile, who works together closely with Agroconnexion, the distributor of Biobest products in Chile has a sound biological explanation for Guido’s observations. He explains: ”Bumblebees have all the characteristics to be excellent blueberry pollinators. They visit more flowers per minute compared with honeybees. When they visit a flower, they fiercely shake the stamen, which causes the pollen to dislocate from the anthers. This process is called sonification and it is unique to bumblebees. It greatly increases the pollen release. Bumblebees are also very active pollinators. They are superbly fitted for colder climates, as they start working at 5°C, whilst honeybees remain inactive under 15 °C. Bumblebees will also perform on gloomy days and in windy conditions. In Chile, this increases pollination levels. 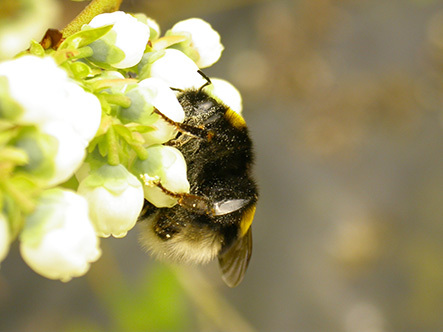 Research shows clearly that bumblebee pollination results in a higher yield and bigger and more uniform berries.